This entry was posted in Events and tagged 2016, City Of Calgary, cleanup, community, Crestmont, Stats, success on July 13, 2016 by aduro. It is that time of year again on June 26th, 2016 (9am – 1:30pm) when all of Crestmont gets out to clean up their yards, garages, and basements and gathers up the debris and garbage to bring down to the Crestmont Hall where the City of Calgary has packer trucks waiting. GEEP will also have bins for electronics and the Crestmont Community Association will have food, coffee and snacks. Make it a fun day for your family! We will have pick-up sticks, vests, gloves and garbage bags at the hall so you can take your family out into the neighbourhood green spaces to pick up garbage and debris that blow in from the wind. This is a FREE event for everyone, although we encourage you to get or renew your Crestmont Community Association Membership if you have not already done so. We will also set up a free table for items that are still in good condition that you no longer wish to keep. Someone else in the community may be able to use it. It’s all about recycling items in a safe manner. This is a family friendly event and a good way to teach our children the value of keeping all our spaces clean and to feel like they can contribute in a positive way by giving back to their community. Please check back here for any updates / changes prior to June 26th. This entry was posted in Events and tagged CCA, City Of Calgary, clean-up, community, Crestmont, debris, family, Food, fun, Garbage on June 22, 2016 by aduro. On June 18th, the CCA with MLA Deborah Drever and the City of Calgary are throwing a community Block Party from 12pm – 3pm to celebrate Neighbour Day! 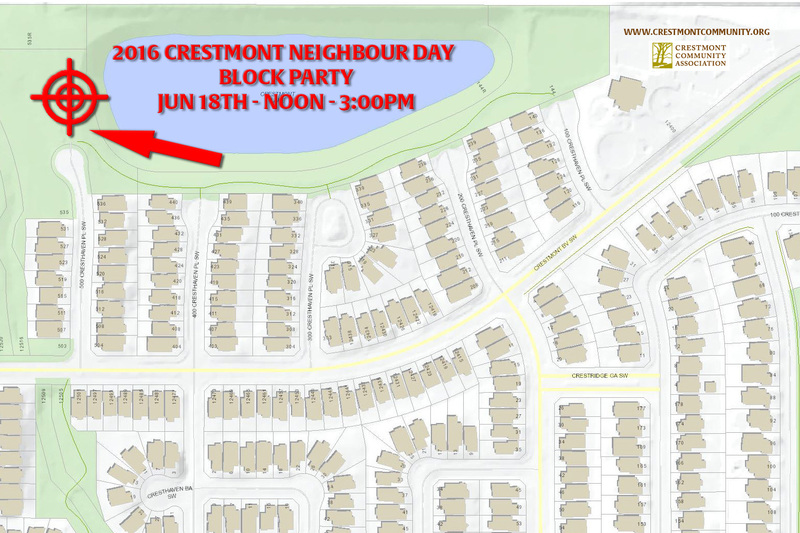 The party will be on the west side of the storm water pond at the end of the 500 block of Cresthaven Place (see map above). There will be Spolumbo’s Sausages and buns, drinks, prizes, games and fun for all ages. Just look for the big bouncy house and all the happy people enjoying the company of their neighbours. Stay informed and visit our website for all the details and any last-minute changes. Please R.S.V.P. for this event as we would like to make sure there is enough food etc. We look forward to seeing everyone out for this wonderful event. This entry was posted in Events and tagged Block Party, City Of Calgary, Crestmont, fun, Games, MLA Deborah Drever, Neighbour Day on June 4, 2016 by aduro. Clear and safe sidewalks are essential for many Calgarians, especially those with disabilities, older adults, and children who walk to and from school. Under the Street Bylaw 20M88, the owner(s) and/or occupant(s) of a private property are required to clear snow and ice from sidewalks in the front or to the side of their property within 24 hours of a snowfall. If the sidewalk is not cleared within that time, The City may have the snow and ice removed from the sidewalk at the property owner’s expense. If you own a rental property, you are responsible for ensuring that adjacent sidewalks and pathways are cleared. Keeping sidewalks shoveled, ice-free and safe can be very challenging for older adults and other Calgarians who have limited mobility. The Snow Angels campaign encourages citizens to clear snow and ice from the sidewalks of their neighbours who may be less able to do it themselves. Watch for people in your neighbourhood who could use help removing snow and ice and lend them a hand. For more information please visit www.calgary.ca/snowangels. This entry was posted in Breaking News and tagged back, City Of Calgary, clearing, danger, elderly, ice, pain, shovel, sidewalk, slip and fall, snow on January 14, 2016 by aduro. This entry was posted in Breaking News, General Information and tagged City Of Calgary, Drawings, Maps, Parks, Pictures, Status, update, Ward 1, YYC on July 29, 2015 by aduro.